(CNS): Following an election in one of the UK’s smallest overseas territories, the incumbent premier Reuben T Meade, leader of the Movement for Change and Prosperity (MCAP), has been ousted from office. Meade has conceded defeat to the leader of the People’s Democratic Party (PDM), Donaldson Romeo, and congratulated him on a “well fought battle”, according to regional media reports. 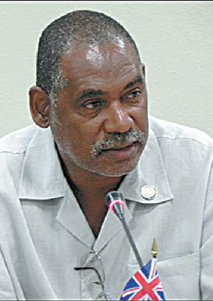 Speaking on the island's radio station Friday morning, Romeo said he was looking at a “convincing victory” for the party and appealed for a united Montserrat as the new government takes over the task of rebuilding the island, which was battered by a volcano some 17 years ago. Romeo said that there was nothing set out in the campaign manifesto that his party could not achieve. I was trying to figure out why on earth this was reported–then I reached the second to last paragraph and all was revealed.